Translation:Do you have a cheese slicer? I must say that I have never in my life talked about a cheese slicer, but by golly, I am going to know this word, whether I want to or not! Your comments here made me laugh crazy :D :D :D thank you! Well, yes, I do know what one is, and I even own one, but I can´t say as I´ve ever used it. This is a really beautiful picture! I did not grow up using one, but after a year of living in Sweden, I smuggled 3 of them back with me and use them almost every day. These people don't mess around when it comes to cheese. But how do you slice your cheese for sandwiches?! With a knife, of course! The tree is constructed to give you everything you need in a Swedish context, and "osthyvel" is definitely something you would need. We use it every day. It is very rare to use cheese knives and very few people buy pre-sliced cheese slices. that's interesting, my family have one of these but we use it for slicing butter, never cheese though! It's great for slicing cucumbers too btw. Slicing butter? Now that's a GREAT idea, I'll keep that in mind. Not necessary in Sweden though as nobody seems to use butter - it's either margarine or one of those butter/palm oil blends. Gah. Everyone I know uses either butter or natural oils such as olive oil. Bregott is practical for sandwiches and at least it's a natural product. I admit I use it for that, but I was thinking about cooking when I answered last time. I'm totally with you on the margarine or palm oil versions, they're horrible. Is this for mozzarella or some other soft cheese? Not normally, or at least not the ones I've used. Usually it's for semi-hard and hard cheeses. Awesome selection of slicers. Now I feel kinda sad about my single very ordinary one. Hmmmmm perhaps time to develop a new obsession? I visited my daughter who lives in Sweden. It is amazing how much cheese is sold in Swedish grocery stores. Swedes love cheese! In particular there is a very popular type of mild cheese which I really liked, which they don't sell where I live (in America). I was told that it is "household cheese". In Swedish it is "hushållsost" - I checked that with my daughter. I had one in my bags as a gift when I left Norway. The sharp pointy image on the x-ray looked like a dagger so my bag got a second scan on its side. This time, the triangle that appeared got me a relaxed "bara ostehøvel" and I was allowed to fly. From a previous lesson - rakhyvel (razor). From this lesson - osthyvel (cheese slicer). What kind of razor, exactly is a rakhyvel? I assume its a straight razor (single blade like barbers use), but could it also be a safety razor? Additionally, hyvel on its own means plane, as in the carpentry tool. Wow, you're good. Knowing rakhyvel and seeing osthyvel, I looked up hyvel. Could've saved myself some time if I'd just looked at the comments first. And you entered it just before I got here, too! A lingot for you! So now I guess I want to know, what does "rak" mean on its own? raka is a verb meaning 'shave', and rakhyvel is created from this. People wrote about hyvel earlier in this discussion as you may have seen (if you're not on mobile). I love how the voice in "osthyvel" is so dramatic in that particular word. It's as if an american shouted "CHEESE SLICER" in a generic conversation, it's great. What about a cheese grater? Cheese always tastes better grated than sliced, after all. A grater is a rivjärn, literally "rasping iron". Although you could easily construct one, we don't really use a separate word for cheese graters. Why not cheese knife. I have several cheese slicers, and I have always called them cheese knives. A cheese knife refers to another kind of cheese slicing utensil. Every time I do this section I have to look up what is meant by a cheese slicer. I eat a lot of cheese, but I don't think I've ever seen a cheese slicer. We have these in the U.S., but it used to be that the nicer-looking ones were imported from Scandinavia. We do call it a "cheese knife," though, and that covers all the designs, as long as they are made for cutting cheese. This got my family in trouble once as my mother told a customs agent that there was a "cheese knife" in the suitcase. All he heard was, "knife." Calling it a "cheese slicer" would have saved us from having the suitcase emptied and gone through, including opening the box that was well-packed and well-sealed for travel. Of course, none of us expected that a knife in a suitcase would be a problem. Every man and boy I knew had a pocketknife on him at all times, or even better, a Swiss army knife with all the extra gadgets. If I remember right, the people I stayed with in Sweden (long ago) called it a knivman. Is that a brand name, eller hur? Apparently it's a Finnish brand. I'd never heard of it. The word knivman is used for "person armed with a knife" otherwise, as in the sensationalist newspaper headline sense. From now on, osthyvel it is! 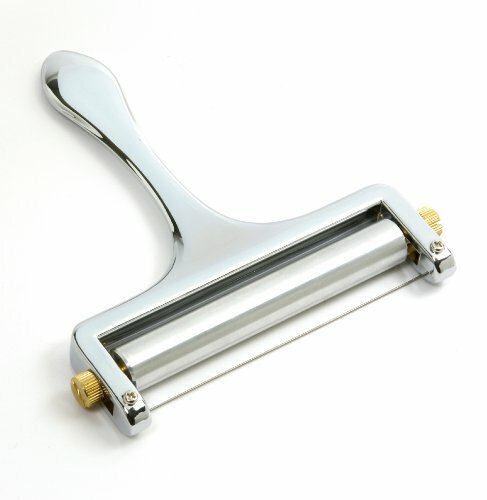 I have looked through all the previous comments and wonder if I am the only one to call this a 'cheese parer' in English?